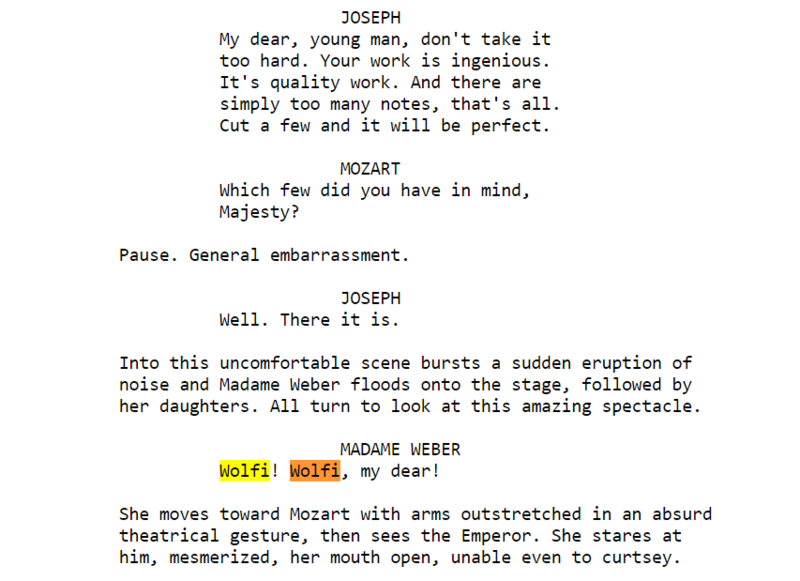 In the 1984 film Amadeus based on Wolfgang Mozart's life, Wolfgang is commonly referred to as "Wolfi", especially by his wife (as spelled in the scripts I could find online). Amadeus also takes plenty of artistic liberties with the actual life of Mozart and I'm aware that using it as a source would be ill-advised. However, there is also a 1994 history edutainment game titled Mario's Time Machine that makes the claim that Constanze's nickname for Wolfgang was "Wolfie". The game occasionally makes oddball jokes or skews the date of certain events to more easily present the information to the players, but when it comes to the history book pictured above, everything in there is supposed to be 100% factual (the underlined parts are sections where the player must write in the answers themselves, and the game only accepts them if they are correct). I want to give the game the benefit of the doubt and believe that they didn't use Amadeus as a source, but my searches online have been bereft of information. The Wikipedia page for Mozart's name doesn't even touch on any potential nicknames of his. The closest I could find is an enotes answer that makes the claim that "the only officially recognized nickname in Mozart's immediate family (aside from his son), was his sister: Maria Anna Mozart nicknamed: Nannerl" (and I can't tell if that includes or discludes Wolfgang Mozart himself), and a blogpost specifically discussing the fictional elements of Amadeus that claims that, "Mozart was never called Wolfie. His nicknames were Wolferl, Wofl and Wolfgangerl. Likewise, his wife Constanze was not called Stanzie, but Stanchen and Stanzerl." The blogpost does have sources at the bottom, but it unfortunately doesn't specify which source is applicable for which section. While "Wolferl" and "Wolfgangerl" do appear in the "Early Journeys" section of Letters of Wolfgang Amadeus Mozart (selected and edited by Hans Mersmann), the other nicknames bring up no results through Google Books, so I'm not entirely comfortable taking the blog post's word as gospel. 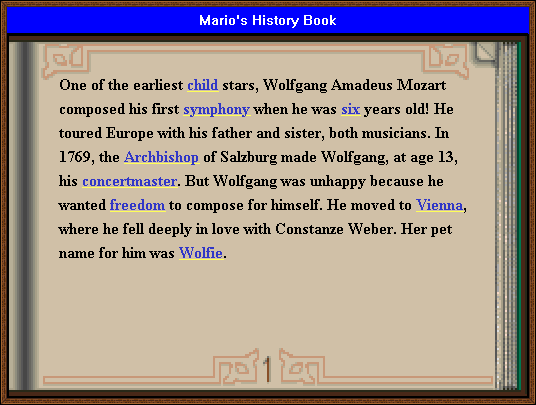 I'm not expecting a letter from Mozart saying, "By the way, nobody has ever called me Wolfi and anyone who says that my nickname is Wolfi is lying," but for a "fact" that seemingly originates from a loose-with-the-facts film yet was included in a history game intended to educate its players, I've found it difficult to definitively conclude, one way or the other, whether Wolfgang's nickname was ever "Wolfie" in his lifetime. The obvious place to look would be in the letters from Constanze to her husband. Unfortunately, as far as I am aware, none of these survive. The letters of Mozart and his family were collected (and translated) by Emily Anderson. These were published in 3 volumes in the 1930's. I was able to find the first and third volumes on Archive.org. As far as I could see there is no use of "Wolfi" or "Wolfie" as a pet name for Mozart in any of the letters. The second volume is on Google Books. A search inside the book didn't identify any occurrence of "Wolfi" or "Wolfie". It looks like it may well be the case that they used the film as a source in this instance. Mozart’s childhood name was “Wolferl”, a south German and Austrian diminutive of “Wolfgang”. “Wolfie” is merely an attempt to translate this into English. Not the answer you're looking for? Browse other questions tagged 16th-century austria music or ask your own question. What was the heaviest example of horse armor (barding) from 16th and 17th centuries?